What do they do? All sorts of things. Perl mongers groups provide a central point of contact and community for Perl programmers of all kinds and abilities. How do I get involved? If you live in (or near) Brisbane you can become involved. The main avenue for this at the moment is through the mailing list, which means that if you are on the mailing list, that means you are a member of Brisbane.pm. The list's activity is "bursty", it's usually pretty quiet but bursts of traffic over a few days do occur. The best way to get involved is to join the list and introduce yourself. The Brisbane.pm mailing list is at: http://mail.pm.org/mailman/listinfo/brisbane-pm. Brisbane.pm meetings have happened on and off over the last few years, and have been pretty informal so far. Watch this space for news. Seminars, Training & Workshops Watch this space for news. What will this page be good for? 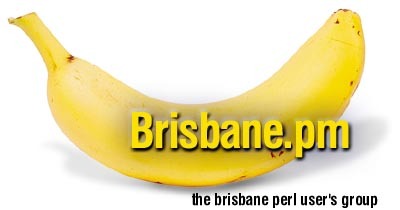 ... Information about local perl activities and events, information about the listserver and links to the good work being done by perl programmers in Brisbane. Are there are other Australian Perl Mongers? ... Yes. The GoldCoast.pm, Sydney.pm, Melbourne.pm and Perth.pm. And in New Zealand there is a NewZealand.pm and Auckland.pm.